Thanks for attending my presentation! 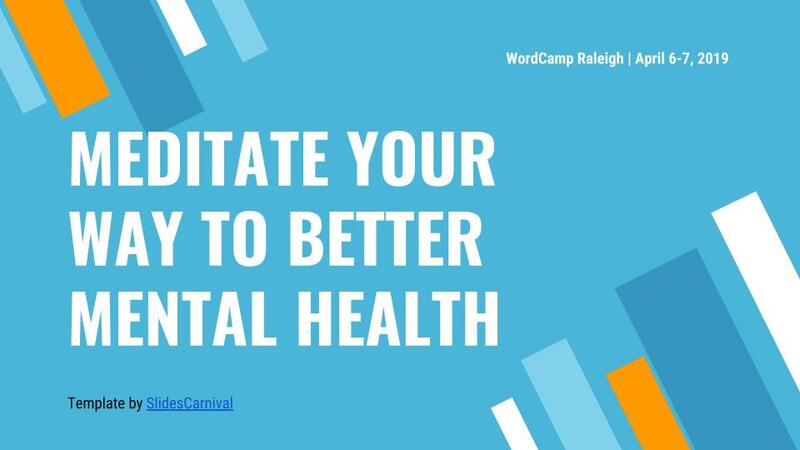 It has been a pleasure to participate in and present during WordCamp Raleigh 2019! It was great to get back to North Carolina for the first time in 21(!) years. I met so many interesting and intelligent people, and it was a great introduction to your local WordPress community. I hope to make a return trip very soon! If you didn’t attend my talk or WC Raleigh, and found this post via other means — no problem and congratulations on your interest in meditation! I hope these slides help you learn more about meditation, how to practice, and the benefits it can provide. I will post the video of my presentation when it becomes available. In the meantime, please feel free to contact me with questions or to share your story. This talk will introduce the concept of daily meditation, tips and best practices for getting the most out of your practice, and how to avoid common obstacles and pitfalls. The session will conclude with a short, 5-minute guided meditation. Thanks to all the organizers, volunteers, attendees, speakers, sponsors, and everyone else who helped to make the 10th annual #WCRaleigh a rousing success!